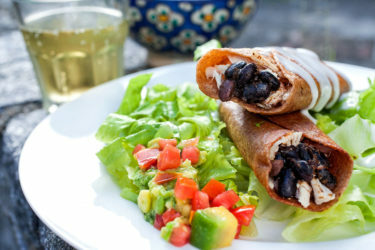 I simply love Mexican food, and I can safely say that it is my all time, most favorite cuisine. I have many favorites, but there’s just something so special to me about Mexican food, the culture, the music, dance, etc. It’s just all screaming my name. When I walk past the various chilies at the fruit and veggie market, I stop and linger there, thinking of how I can incorporate them into a nice meal. Usually when I bring home poblano peppers, my son immediately wants me to make green chile cheeseburgers, and that’s what I end up cooking. This time however, I told him that its Mom’s turn, and my mind was on Chiles Rellenos…say it…the name is so inviting. I must say, I greatly enjoyed this meal. I felt as if I was sitting in one of my favorite Mexican restaurants. After they’re blistered and charred all around, place them in a resealable bag and allow them to steam for about 15 to 20 minutes. Remove the peppers from the bag and pull off the skin. This should be quite easy. If you run into a few ‘stubborn’ spots, gently wipe with a paper towel. However, be very careful–we don’t want to tear the pepper. This is a delicate operation. Don’t worry if a few charred spots remain. This will add good flavor. Generally you want to stuff them with cheese only, but you can stuff them to your liking–meat, vegetables, meat and vegetables, etc. 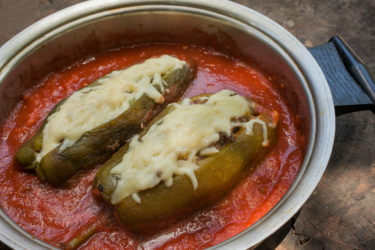 I had already cooked up some ground beef for tacos to accompany the peppers, and my men-folk like a nice stuffed pepper. So I added some of the taco meat to a few of the peppers. Add the shredded Monterey Jack cheese on top of the meat, and repeat with the rest of the peppers. As mentioned, two were stuffed with the addition of the taco meat, and two were stuffed with Monterey Jack cheese only–I preferred the cheese only peppers. You may have to use tooth picks to secure the peppers–we don’t want to lose any of that filling while they are frying. Use an electric hand mixer to whip the egg whites until they are nice and fluffy. Perhaps you’ve noticed that there is only one beater on my mixer. Well, I’ve had this thing for years…years!…and several years ago the lodging for one of the beaters broke. I just couldn’t throw it out and found that the one beater sufficed. This was one of my very first kitchen utensil purchases back when I was a teen. Give the egg yokes a little stir to mix, then add to the egg whites.. Turn to get all sides, as for around the stem, I constantly spooned the hot oil onto the chile so as to brown it. You can do that for those spots that are difficult to get into the oil. Plate on the sauce, drizzle and crumble on the cheese. I made the sauce by roasting a red bell pepper, and the sweet red pepper the same as I did the poblano peppers. I put them into the blender along with some grilled (jarred) piquillo peppers along with a little salt and pepper to taste, a roasted garlic clove, a little olive oil, and blended till smooth. So very tasty. I’ll be making these again quite soon. 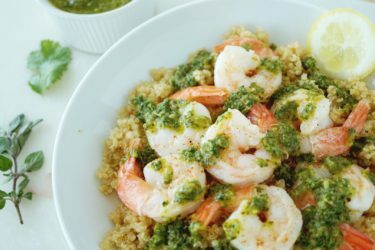 Please note: We regret that this recipe’s format is not compatible with ZipList.